Former USCG Admiral Thad Allen is a transformational leader in the history of the service, a rock through thick and thin. Today he talks about resource allocation, risk management and homeland security. The Coast Guard is under pressure to either pare its mission mix or downscale what it does. What’s your overall take on this situation? One of the reoccurring challenges of being in a service like the Coast Guard is that you have more authorized missions than you have resources to accomplish in a given year. I think we all understand that there won’t be large growth in those budgets unless there’s a real reason to do that. But that [brings to mind] what I call the operational genius of the Coast Guard. That means you have a multi-missioned organization, and you can apply your resources to the highest risk. The funding level will be what the funding level is, but the execution of the resources provided will always be done in an optimal fashion because the Coast Guard allows delegation of authority to regional commanders to apply resources to the highest needs. And as long as that continues to be the operational doctrine of the Coast Guard, then the American public can have the confidence that whatever the funding levels allocated, those resources will be applied according to the current set of risks. Now, that may, from time to time, be emphasizing one set of authorities or jurisdictions over another. In my view, the service has done that very well. So how do you more with less? Over the last I don’t know how many years, we’ve reduced our budget discussions to proverbs like “doing more with less.” There is a risk-based decision process that allows for the allocation of resources, and this drives what gets done and does not. It’s hard to predict a year in advance what the challenges to the operating environment will be. It was always a challenge when I was commandant to look at our program budget because we would keep track of our operating hours and allocate costs to those hours so that we could demonstrate the cost of a particular mission in a particular year. There was always the temptation by Congress to use that as a projecting device rather than a documentation device. So, in a constrained budget environment, you have to prioritize by risk and allocate resources accordingly. Now the risk in the Gulf of Alaska is never going to be the same as the risk in the Gulf of Mexico. These will ultimately be decisions made according to the operating environment or conditions, by people who know these conditions well. What is the decision process for prioritizing risk? We have a MISRAM – or a Maritime Security Risk Assessment Tool – it’s a protocol that was developed after the attacks of 9/11. I was the Atlantic Area Commander on 9/11, and we did not know what was going to happen after the attacks. We were concerned as to whether the seaports were at risk. So I took some short-term actions and deployed some Coast Guard cutters off all the major East Coast ports so that they could be a floating command and control platform and a resource for the captains of the port. But we immediately set about trying to devise a way to decide how to determine risk in ports, and how to allocate resources to that model – especially when you have a set amount of resources. And from that, we created the Port Security Risk Assessment Tool. It had a pretty indelicate acronym – everyone called it PSRAT. But, I took a bunch of my guys and I threw them in a room and said – if the Captain of the port had X amount of boat hours and X amount of flight hours and a cutter offshore and we want to make a risk-based decision, is there a more quantifiable or rational way to do that? So you do a port assessment: the waterfront facility, the refinery, is there a cruise ship there, how many pleasure boats – whatever variables exist. And then, you take a couple of scenarios like a weapon of mass effect or an IED [improvised explosive device] and then you calculate the consequences associated with that scenario. This is almost like the actuarial information used to develop insurance models. And we came up with a way to determine ratings, which would determine resource changes as a consequence of what happened with each scenario. 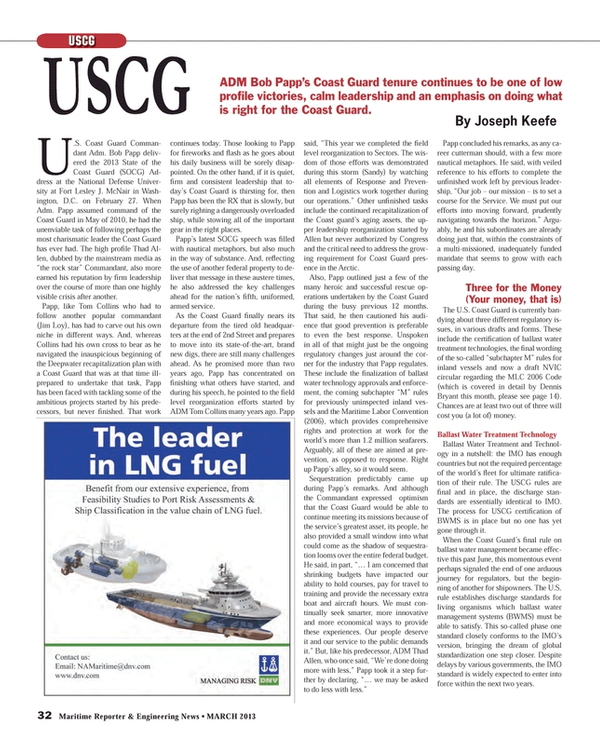 The better question to ask then – and I’m not the best person to talk to about this right now – is, how is the Coast Guard applying MISRAM to resource allocation, especially in context to current budget discussions? Is the pace of the regulatory development process moving fast enough? If you look at the ballast water question, the non-tank vessel rules – which actually started around the time of the Exxon Valdez spill – nobody should be happy with the amount of time it takes to make regulations. We have gotten into a situation where the process is long and laborious, and the levels of review numerous. Now, when you are talking about five, 10, 15 years to develop a rule and deploy it as a result of a statutory requirement, I don’t think anyone should accept that that’s the right way to run government. Any way we can look at regulatory reform, we ought to be looking at it. I think we need to figure out a way to engage the public earlier - perhaps by experimenting with some sort of a wiki-platform where we could put a policy problem out there and let the supporters and detractors have at it. In this way, you can define the problem, and possibly see the consensus forming around a particular course of action before you go into rulemaking and all the Title 5 restrictions on ex-parte communications start to kick in. What is the impact of social media, and can it be managed? Twitter, smartphones, blogs - anything that allows people to aggregate information and produce social effects when they are not in each other’s presence – in my view have fundamentally changed our lives. I see this change as the sociological equivalent of climate change. John Holder, who was a science and technology advisor to the president, said this about climate change, “You can suffer, you can adapt, or you can manage.” The same can be said for social media. We’ve demonstrated that there is real value – and considerable risk – to crowd sourcing. It’s a new area of collaboration; a new area of social interaction where we don’t have a lot of history, and we’re really not sure where we are going. It doesn’t mean we shouldn’t use it because we’re scared of it. The fact is, it’s there, and there’s no fear of entry when an event occurs and anybody standing around with a cell phone with a camera in it can actually become part of the event or the outcome of that event. I think we have to deal with the fact that this is the reality we live in. Are there missions the Coast Guard could cede to others in an effort to more efficiently spend money or more competently get the job done? Were you enforcing maritime safety? As commandant, I made a concerted effort to reach out to all stakeholders in the maritime community. We put resources back into the regulatory compliance functions and put into place a long-term safety and improvement plan. [Rear Admiral] Jim Watson wrote it from when he was still in the Coast Guard. And he took concrete steps to make sure we were carrying out our responsibilities. Are there missions currently housed elsewhere that the Coast Guard could more efficiently take on? We should talk about this in context to any capacities and capabilities that might be exploited for greater efficiencies. The current role of the Coast Guard in the intelligence community is not well understood, nor is the value demonstrated every day by what our people do in intelligence. We are a full member of the intelligence community; we have a service cryptographic element at Fort Meade. We have people that work with DoD every day, adding value. We have unique capabilities because the Coast Guard operates in places that other agencies don’t. The government would be well served to find more ways to use the unique capabilities of the Coast Guard, because there are some out there. Is the Coast Guard now housed in the right place – DHS – or would it be better situated in another domain? You have the experience of being the Coast Guard’s chief executive, and now, the luxury of looking on from the sidelines after a job well done. What has changed in the 3-plus years since you left the service? I’m not in touch on a daily basis with what the Coast Guard has going on, so I am not in a position to say anything about what’s happened since I left. I can tell you this: the Coast Guard has made extraordinary improvements in institutionalizing its acquisition program that’s delivering vessels like the fast-response cutter and the national security cutter. When I became the commandant, I spent a great deal of my time preparing for oversight hearings related to our acquisition programs. I think the coast guard can be very proud as to where they’ve come with regard to those programs. What’s the biggest challenge facing the Coast Guard today? Is it operational, fiscal, manpower-related – or, all of the above? The biggest challenge for the Coast Guard – and it has been since it was created – is to develop and retain cultural and organizational competencies to manage operational risk and apply those resources. That is the key element of what I call the operational genius of the Coast Guard. The only way you can run an organization as unique as the Coast Guard, and have it be as effective as it is, is to have leaders who know how to make resource allocation decisions and be held accountable for them. The enduring value of the Coast Guard is it is still able to do that. The Coast Guard is a unique product of the American Revolution. Before the Revolution, you had navies; you had border guards and police forces at harbors and things like that. The origin of the service emanates from the Founding Fathers, who realized that this was the only way with this much trade going on. Tom Ridge [first director of DHS]said, ‘If we didn’t have a Coast guard, we’d have to invent or create one.’ If you look around the world, most countries are mostly interested in what happens in their littoral waters, about their natural resources, issues about illegal fishing, drug trafficking, offshore oil development, etc. All of those mission sets call for a maritime constabulary force that is much more adaptable across those ranges of threats. The key is to reconcile the security demands for a navy and the local law enforcement missions. We’ve been able to do that in this country. Looking back on your service – what part of it are you the most proud? If you look back at the advances that have been made in the finance and acquisition areas, and the extraordinary advances in how we manage lifecycle sustainment assets, and how we’ve reformed our supply chain management and maintain our operating platforms, these are fundamental business re-engineering activities that we probably won’t know the results of for many years. A great legacy would be to be able to say we fundamentally changed how we do things inside the Coast Guard, and for the better. These aren’t things that are generally seen by the public. Conversely, where do you wish you could have accomplished more or something a little bit differently? I wish I could’ve speeded up the regulatory process. I talked to everyone I could about this issue, but unless there is a national will to do something about it, it likely isn’t going to happen. I was continually frustrated with the regulatory process. Graduated 1971 from the Coast Guard Academy, an institution Sen. John McCain joked was one that “some might say he foolishly chose over an appointment to the Naval Academy.” (Allen’s father was a Chief Damage Control man in the Coast Guard.) Two advanced degrees: Masters in Public Administration, George Washington University, 1986; and Masters of Science in Management at MIT’s Sloan School, 1989. Held a variety of posts ranging from ship master to commander of various USCG regional and coastal groups, to posts in the office of acquisitions, office of programs, and office of chief of staff, eventually becoming chief of staff to the commandant. Command of the Coast Guard’s Atlantic forces in its response to the Sept. 11, 2001 terrorist attacks by securing ports on the eastern seaboard. Appointed Principal Federal Officer for Hurricane Katrina and Rita recovery efforts in the Gulf Coast region in 2005. Commandant of team leading response to Haiti earthquake in January 2010. Allen was also the commandant leading the response Appointed National Incident Commander for the Deepwater Horizon oil spill in the Gulf of Mexico in 2010 while still commandant of the USCG. He continued in that role after his retirement from the Coast Guard. Worked closely with the Department of Homeland Security, advancing much-needed operations and management coordination principles. Recognized as a leader in homeland security strategy, with particular emphasis on achieving interagency unity of effort in the complex, multi-agency and multi-jurisdictional homeland security and law enforcement mission environment. Chairman of the DHS Joint Requirements Council from 2003 to 2006. A four-star admiral, he became the 23rd Commandant of the U.S. Coast Guard on May 25th, 2006, where he was known both as “the Face of the Coast Guard” and as a forward thinking leader who led a major effort to update the Coast Guard’s command and logistics organizations and address future maritime challenges. As commandant, Allen oversaw a mix of 90,000 active-duty military, civilian staffers, reservists and volunteer auxiliaries. Retired: In May 2010, after 38 years with the Coast Guard. Post retirement, continued to serve as the National Incident Commander for the Deepwater Horizon oil spill as a member of the Senior Executive Service within DHS. Two Coast Guard Distinguished Service Medals; the Legion of Merit, which is awarded by the U.S. Armed forces for exceptionally meritorious conduct in the performance of outstanding services and achievements; the Defense Distinguished Service Medal, three Meritorious Service Medals, three Coast Guard Commendation Medals and two Coast Guard Achievement Medals. Allen serves as a Presidential appointee on the NSF’s Blue Ribbon panel on Antarctica, as a Director at the Partnership for Public Service and the CG Foundation, and at the U.S. Naval Institute, 1974-Present. He was on the Board of Trustees, U.S. Coast Guard Academy, 1996-1999. Joined Booz-Allen Hamilton in November 2011 as Senior Vice President leading “thought leadership” on law enforcement and homeland security strategy. Allen previously joined RAND Corp. as a senior fellow in Oct. 2010, where he focused on myriad of disaster response, maritime safety and homeland security issues. “I note that this [nomination] is somewhat ironic, since the largest body of water in the Admiral’s hometown [Tuscon, Ariz.] is the University of Arizona’s swimming pool.” Sen. JOHN McCAIN (R), Ariz., while introducing Allen at a his March 2006 nomination hearing for the post of Coast Guard Commandant.